The study, "Juvenile survival, competing risks, and spatial variation in mortality risk of a marine apex predator," published today in the Journal of Applied Ecology, confirms that unintentional capture in fishing gear (bycatch) is the greatest cause of death for young white sharks, a protected species in both Mexico and the United States. More broadly, data from pop-up archival tags (PAT tags)—which have been used worldwide to track tens of thousands of individual ocean animals, including white sharks—represent "a widely-available, untapped data source that could dramatically increase our understanding of marine population ecology," said lead author Dr. John Benson, an assistant professor at the University of Nebraska. "We always learn things from adjacent fields," said Dr. Salvador Jorgensen, principal white shark scientist at the Monterey Bay Aquarium and senior coauthor on the paper. "Before coming to the aquarium, John made his name studying mountain lions in Southern California. We were excited to see how the methodologies John was using for land-based predators could be applied in the ocean." "Because the PAT tags record detailed data on temperature and diving, it is possible to reconstruct the fate of the shark in the final minutes of each track," said Jorgensen. "We've looked at these data for years and often noted when a tag ended up on a fishing boat or in the stomach of a larger predator. Surprisingly, nobody had yet connected the dots to use this information to estimate a critical demographic rate: annual survival." "We are learning that the gillnet regulations in California, although originally designed to protect sport fishing interests, have done a lot to protect juvenile white sharks," said Dr. Chris Lowe, director of the Shark Lab at CSU Long Beach and a coauthor of the paper. "In terms of reducing white shark mortality, avoiding setting nets close to shore and checking them frequently appear to be the best practices," Lowe said. "It's the best way to go," he said. "Mexican fishing communities play a vital role in enabling this research as well as helping us solve any issues as they arise." CICESE doctoral student Emiliano García-Rodríguez, another coauthor, added: "It's very important to work with the fishermen, because we want to know whenever they incidentally catch a white shark." 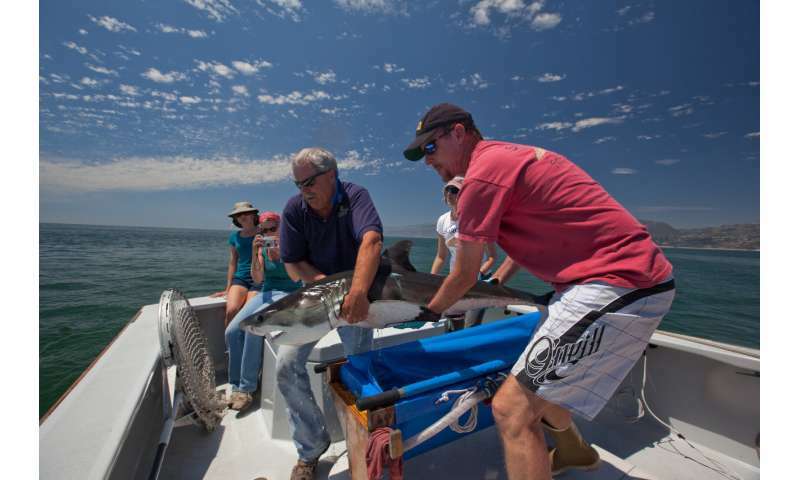 "This research suggests the importance of a collaborative approach to management in California and Mexico, and opportunities to innovate on best practices that can support fishermen, research and protections for white sharks," Jorgensen said.